An Alien Digimon shaped like something that came from the far reaches of the cosmos. However, it is rumored that it was born from the seed of a plant. While hard to imagine from its overdeveloped head and octopus-like lower body, it carries terrifying offensive power. The Abduction Kousen which it fires from the ray gun it holds in its hand is also a threat, and its Special Move Akuma no Nage Kissu is a terrifying technique which makes a complete fool out of the opponent. Akuma no Nage Kiss  Devil's Blown Kiss 悪魔の投げキッス Akuma no Nage Kissu Unidentified Flying Kiss/Evil Kiss Blows a kiss at the opponent, either causing them to panic or hurling asteroids at them. 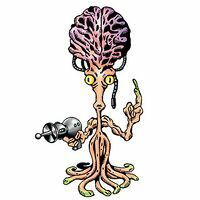 Abduction Kousen  Abduction Ray アブダクション光線 Abudakushon Kousen Alien Ray/Abduction Beam Attacks with the hand-held ray gun it carries. 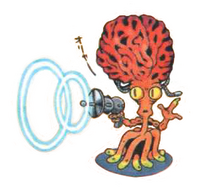 ミューティレート Myūtirēto Mutilator Shocks the opponent with a mysterious light emitted from its hand or spaceship. Fires a ray from its gun that prevents the enemy from evolving. When Izumi Koushirou and Tentomon fell into his pocket dimension, Vademon convinced Koushirou to give up his curiosity but Bubbmon helped Koushirou get it back. But at the same time, Pico Devimon wanted Vademon to sell him Koushirou's crest. A fight ensued and resulted with Kabuterimon evolving to Atlur Kabuterimon and beating Vademon, collapsing his pocket dimension. A Vademon worked as a fortune teller at the Fortune Teller Village while other Vademon were seen at Akiba Market and the Great Trailmon Race. A Vademon was seen in a glass tube inside the room where Thoma's sister, Relena was. One Vademon is part of Tobari Ren's collection. Vademon from Digimon World. 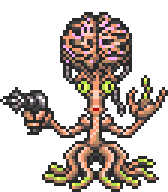 The replacement of its tentacles with its UFO is due to the difficulty of rendering with the graphics of the time. 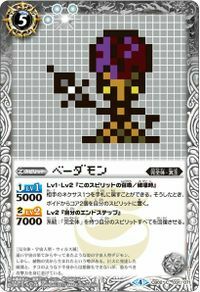 Vademon appears as an obtainable Perfect-level Virus type Digimon in Digimon World. In the Mount Panorama, on the eastern screen you'll find strange circle marks in the floor. If you come to the same screen once in a while, there's a chance that more and more of the circles will start showing up in the floor. 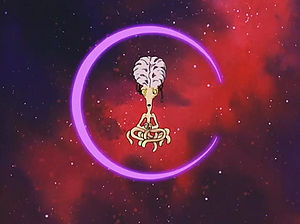 After the third circle is shown, a Vademon will come and will be convinced by the Player to join the Village of Beginnings peacefully, with no intentions of battling. Vademon joins Meramon, Tyranomon, Yukidarumon, Garurumon and Digitamamon in the Restaurant, cooking special alien dishes such as Space Salad, UFO Soup and Galaxy Course that raise your Digimon's stats. All 29 Adult Digimon in the game can evolve into Vademon, this is triggered when your Digimon is at least 15 days old and has a Discipline below 50%. If you scold it, it will automatically evolve into Vademon though its not guaranteed as this only has a random 50% chance of happening. This is useful to extend the lifespan of your Digimon for more or less 5 days if it hasn't evolved yet. Vademon's Digivolution item is the Ray Gun which lets any Adult Digimon evolve into Vademon. In the arena, Vademon can participate in the Version 2 Group, and appears as an opponent in the Nature Cup, Metallic Cup and Humanoid Cup. Vademon appears with Octmon and Gesomon in the CODE Domain, Laser Domain, Diode Domain, Scan Domain, Patch Domain, Soft Domain, RAM Domain and finally, Core Tower. Vademon also fights as a boss in Laser Domain with Cyclomon and Tuskmon, and in the Data Domain with Phantomon and Vamdemon. Vademon evolves from Guardromon (0-5 DP), Platinum Scumon (0+ DP) or Raremon (0-4 DP). 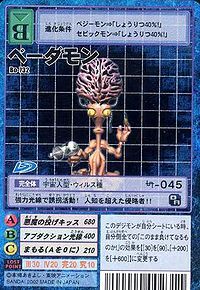 Vademon appears in the Rare card group as a Perfect level. Enemies use Vademon's card in the Who Are You? Deck. When using the Card Fusion aspect, it combines with Lady Devimon to make Real Metal Greymon, Venom Vamdemonto make Gigadramon, Omegamon I to make Were Garurumon, Agumon to make Yukidarumon, Solarmon to make Gekomon, Omegamon II to make Herakle Kabuterimon, Marin Angemon to make Super Starmon, and finally, Rosemon to make Lady Devimon. Vademon is made when combining Lady Devimon and Metal Greymon, Brachiomon and Holy Angemon, Vikemon and R-Tailmon , and Pinocchimon with the Another Dimension option card. Tamer George uses Thunderballmon and Vademon to fight you at Bulk Swamp, in the South Sector as well as this, a Royal Guard member uses a red variant of Vademon, along with a Mugendramon and a Whamon. Vademon also appear individually as an enemy in the Mobius Desert, where in the Asuka Server they can drop Bolt Power 1, in the Ameratsu Server, the red variant appears and can drop Cursed Puppet. 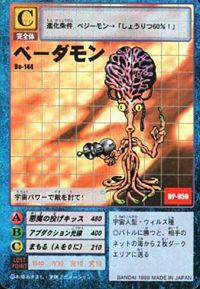 Vademon can also be found as a card to be used in card battles. In this form, enemies use it in there decks, including LV39: Winged Hope Folder (#2), LV44: Strange Folder (#2), LV51: Deck Destroyer Folder (#2) and finally LV66: Chain Attack Folder (#1). Vademon is an obtainable Virus Perfect-Level Digimon and belongs to the Nightmare Soldiers Field. While Vademon doesn't evolve from any Digimon, it evolves into Ebemon. Vademon can also be Jogressed from Red Vegimon and Nanimon and can Jogress with either Piccolomon or Lilamon to become Babamon. 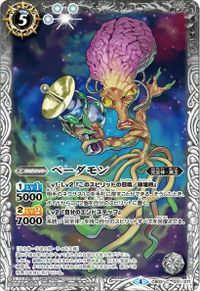 A Vademon, along with a Parasimon and a Moon Milleniumon, appears as an opponent sent by one of the Tamers that ascend you to the Silver Rank if you defeat them. Vademon evolves when enough time passes from Wizarmon, Gesomon, Geremon, Starmon, Vegimon and Red Vagimon. It shoots the opponent with cosmic power! 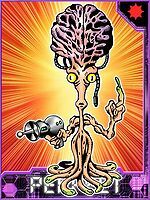 It carries out abductions with its powerful ray gun! This invader has surpassed human intelligence!! An Alien Digimon shaped like something that came from the far reaches of the cosmos. However, it is rumored that it was born from the seed of a plant. While hard to imagine from its overdeveloped head and octopus-like lower body, it carries terrifying offensive power. This page was last modified on 17 November 2017, at 02:45.